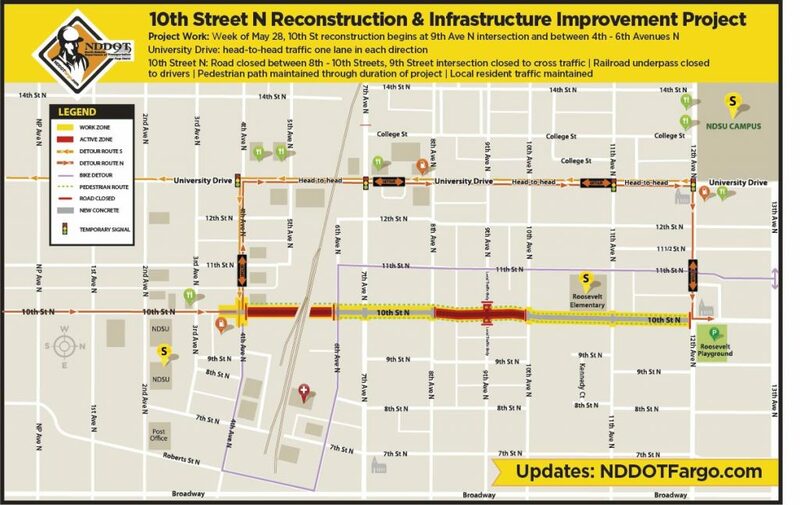 Starting this week, construction activity will begin for the 10th Street North Roadway Reconstruction and Infrastructure Improvement project. 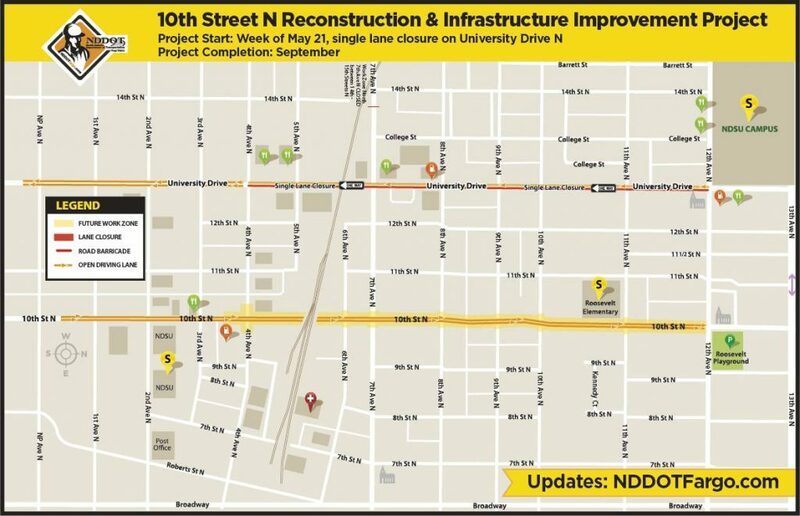 This year the North Dakota Department of Transportation (NDDOT) Fargo District and City of Fargo will replace aging infrastructure and continue the city-wide effort to upgrade services for residents and businesses on 10th Street N from 4th Avenue N to 12th Avenue N.
Tomorrow, May 22, crews will close one lane on University Drive between 12th and 4th Avenue for drivers. Crews will begin to install traffic control devices, temporary traffic signals and remove pavement markings to prepare University Drive to carry head-to-head traffic throughout the summer and early fall. Northbound one-way traffic will flow as usual on 10th Street N during this preparation work on University Drive this week. Starting next week, Tuesday, May 29, weather permitting, motorists will be detoured from 10th Street N to University Drive on 4th Avenue N. 10th Street N between 4th Ave N to 12th Avenue N will be closed to traffic throughout the duration of the project. Work zones are not present to inconvenience drivers, they’re an important part in maintaining and rebuilding North Dakota’s infrastructure. Rear end crashes are the most common in work zones. Motorists are encouraged to slow down, allow extra distance between their vehicles and the vehicle in front of them. Motorists are encouraged to add five extra minutes to their travel plans through the area. Speeds will be reduced on University Drive. This project is being funded by federal, state and local funds. May 22 crews will close one lane on University Drive between 12th and 4th Avenue for drivers. Crews will begin to install traffic control devices, temporary traffic signals and remove pavement markings to prepare University Drive to carry head-to-head traffic throughout the summer and early fall. Project Funding: The project cost is $7.1 million. City: $2.5 million (Sanitary sewer and water main work along with other miscellaneous items are completely funded by City of Fargo).